Falling yen volatility wasn't enough to keep GMO Click from reporting a superb month of trading volumes during September. August was a breakout month of Japanese yen volatility as stock market plummets in China and the rest of the world sent funds towards the safe haven currency. September though was far from an active month for the yen. Unsurprisingly, trading venues such as the Tokyo Financial Exchange and CME both showed lower yen trading in September. Bucking that trend though was GMO Click which reported strong volume growth during September. For the month, spot FX volumes rose 16% to ¥131.16 trillion. The figures were the broker’s second highest for 2015, only surpassed by their all-time high of ¥140.9 trillion set in January of this year. Converted to US dollars, this is a value of $1.182 trillion. GMO Click’s September volumes valued in dollars once again passed the $1 trillion barrier, coming in at $1.093 trillion. Together with DMM Securities, they are the only retail forex brokers to have ever surpassed the $1 trillion milestone in monthly volumes. 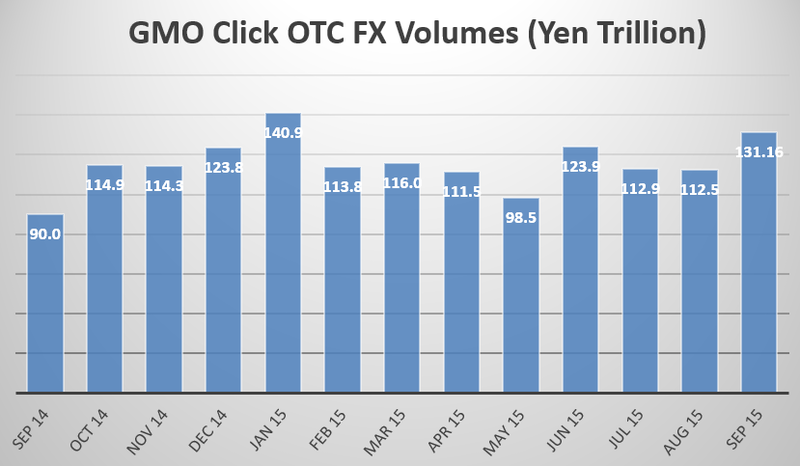 With September’s record performance, GMO Click is expected to hold its position as the world’s top retail forex broker for volumes for the quarter just completed. Other than in Q1 2015 when they were surpassed by DMM Securities, GMO Click has held this top spot with Finance Magnates Quarterly Forex Industry Review since Q3 2013.